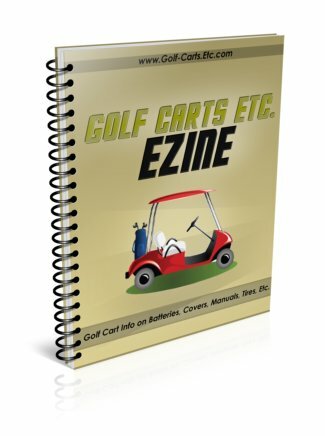 Golf cart tires and wheels can be purchased as a package or kit, which saves money and often mounting fees. They offer a custom look to any golf cart. Just ask any guy,"What's the first thing you notice about a golf cart or car? It's the wheels and tires. It's easy to find a large selection of tires and wheels assembled and most often the prices are better for tire and wheel combo kits. When it's time to get some new tires you can make your selection by the tire size, tread design or manufacturer. Now is the time to think about upgrading or changing your wheels as well. By getting a tire and wheel combo you can get the golf cart tires already mounted on the wheel. The main factor for determining the tire size is if you plan to use a lift kit. If not, the most common tire sizes are 8", 10" and 12". One way to get your golf cart to go faster is to use larger tires. 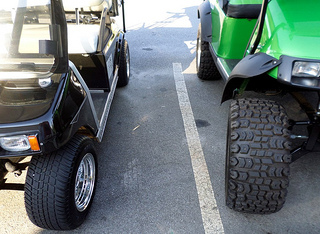 The standard size tire that comes with most golf carts is 8". I've upgraded to a 10" tire. The larger tire covers more ground per revolution than a smaller tire giving it an extra boost to get where you are going faster. You need to start shopping for golf cart tires when the tread gets really worn down, just like with your car tires. The variety of choices can be overwhelming so first determine how and where you plan to use your golf cart. If you use your cart on the golf course it needs to be a low-impact tread pattern that does not harm the the grass. Typically called turf or street tires, these tires can be used on and off the golf course, which includes driving around the neighborhood on paved roads or paths. The depth of the tire tread can vary with the knobby tread being the most aggressive and best used in mud and for off-roading. These off-road terrain tires have a thicker tire tread that will help add traction for driving on unpaved country roads or in the woods. 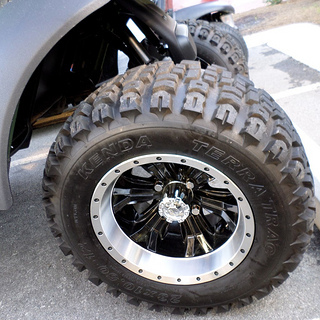 Want a larger tire without having to add a lift kit? Consider these larger low profile tires - just like the picture - there is much less tire but much more wheel. You can use a 10" or 12" tire without having to put on a lift kit. Because there is less tire, there is also less cushion, which means these are not the best tires for off-roading or on bumpy terrain. 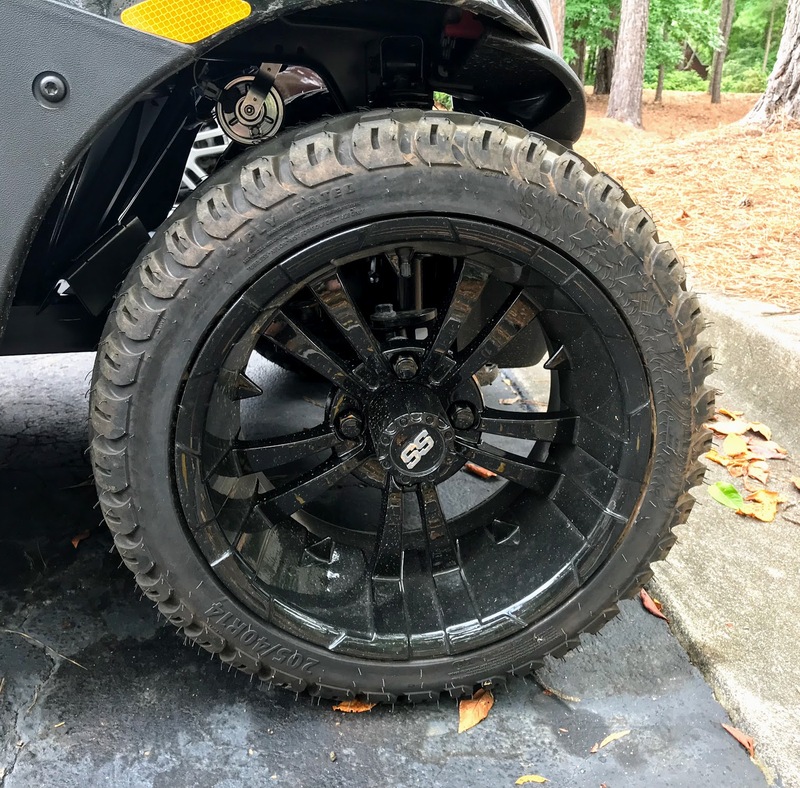 Get a set of 4 all terrain tires, 10" bulldog black aluminum wheels, 4 black center caps and 4 sets of black lug nuts with this custom golf cart wheels and tire set. 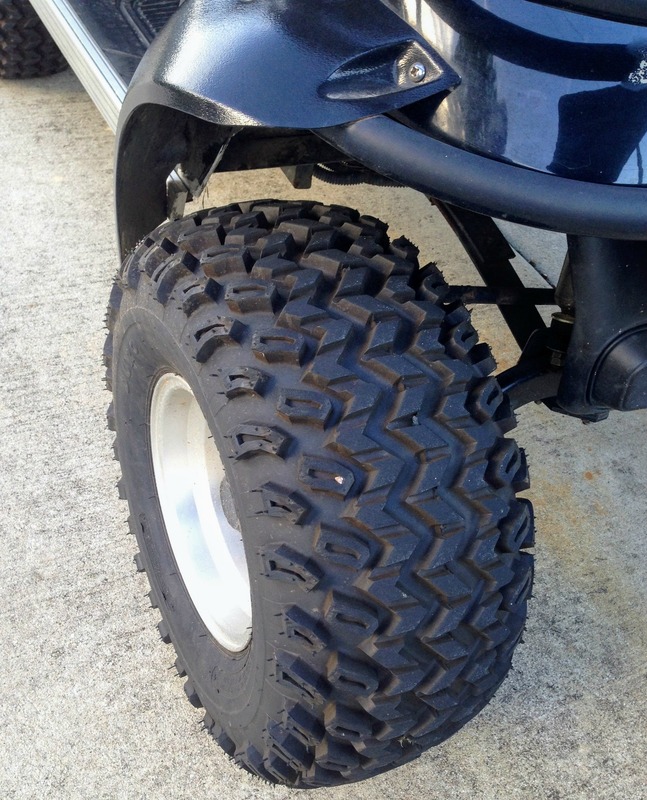 The wheel and tire combo measures 22" tall which means that a lift kit is need for Club Car, Ezgo and Yamaha carts. All terrain tire tread is great for off roading (but check to see if allowed on your golf course). The wheels come mounted and the tires are filled to the proper pressure. This is a 4 bolt wheel (and tire) set. "Do you need 10 inch golf cart wheels?" my wife asked when we were customizing our refurbished golf cart. "Of course we do" was my reply "and they need to be chrome too." Thankfully, my new friend Dean at Affordable Golf Carts explained to her that 10" tires makes for a smoother ride and the accompanying wheels dresses up the golf cart. Golf cart wheels come in 3 different sizes - 8", 10" and 12". The size of the tire determines the size of the wheel. An 8 inch golf cart wheel fits golf cart tires that end in an 8. You will find the number on the sidewall of your tire - for instance these numbers are on our tires - 18x8.50-8 - this mean we would need an 8" wheel. 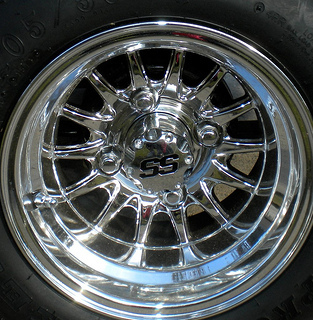 4 bolts is a standard golf cart wheel pattern. 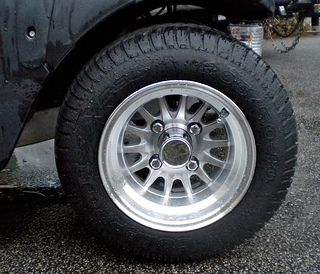 Golf cart tires and wheels are not specific to any golf cart make, model or year. Check out different finishes and/or color combinations before making your selection. These wheels are made of steel or aluminum construction and can cost anywhere from around $300 for a set of four wheels and tires to well over $800. The three most common finishes are chrome, polished and machined. My favorite is the chrome which also happens to be the most expensive. They offer a high-luster finish or shine combined with durability. Easy to maintain, I just wash my wheels with soap and water (never use any abrasive cleaners). A machined finish means that there is no finish on the wheel - this is the wheel that normally comes with a standard tire and wheel. It may have a paint finish or a clear coating and is the cheapest wheel available. Polished wheels requires more maintenance to keep it looking shiny. I could have spent hours, well maybe days, looking at different custom golf cart wheels. After living in a golf cart community for 16 years driving a ho-hum 1987 Club car, this was my chance to get a golf cart that I was proud to own. There's nothing like custom golf cart wheels to dress up a golf cart. I knew that I owned a golf cart to be envied when I was driving through a busy parking lot and a man just stood there with his eyes glued on my cart as I drove passed him. Here's the scoop on wheels. 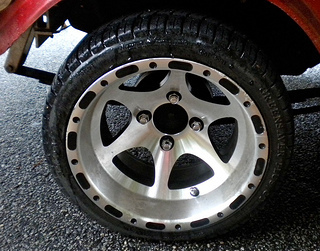 Depending on the look you want, wheel finishes come in polished aluminum or chrome. Polished aluminum has a tendency to spot so there's a bit more maintenance to keep it looking good. The number of spokes can also mean more or less maintenance - but who really cares. Go for what looks best for you. You can find wheels with 4 spokes or up to 14 and more. Some people like a more solid, hefty look with 4 really wide spokes and others prefer the look that is pictured with 14 spokes. Wheels can have 4, 6 and 14 or more spokes, each offering an individualized look. One is not better than another, it just boils down to personal preference. 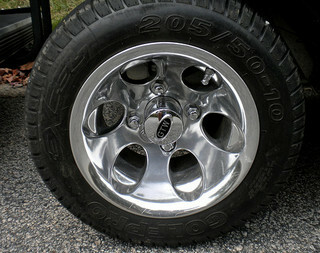 The typical golf cart wheel and tire has 4 lug nuts, but they can have 6 or more. Be sure to check to see which one you need. Sometimes the lug nuts come as part of the wheel and tire set. If they don't be sure to get them in the same finish as the wheels. You can increase your axel width by a total of 4" (2" per wheel) with golf cart wheel spacers. Lifted golf carts especially benefit from wheel spacer as they provide extra clearance, lowers the center of gravity and makes your cart more stable, especially going around corners. Golf cart wheel spacers widen your cart and most guys like how they look as well. For those of you who like to take your golf carts off road, adding wheel spacers widens the base of your cart. This results in a more stable and easier to handle golf cart. Some spacers will work with any model of golf cart - including Club Car, Yamaha and EZ Go and other spacers are specific to the golf cart manufacturer. The size of the wheel also determines which spacer will fit your golf cart. Wheel spacers are specifically for golf carts with lift kits and come in several different sizes ranging from 1" - 3". They are simple to install. They can be purchased individually or in sets of 2 or sets of 4. You know how there's always one more thing ....well you can't have new wheels without a new center cap. Some golf cart tires and wheels combo kits include the lug nuts and center cap. You would think they'd come with a set of wheels and tires, but not always. Sometimes they do, sometimes they don't. My SS center cap cost around $6 each. Again be sure to get it in the same finish as your wheels. Once you have figured out the size of the tire and wheel and what finish you want, it's time to start shopping. 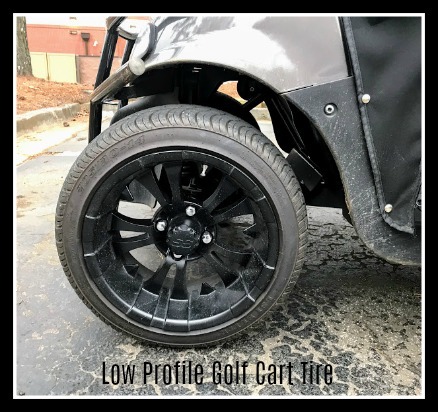 Golf cart tires and wheels can be a big investment but can also provide a smooth comfortable ride and a customized look that's all your own.